First, I want to thank everybody who went over to Amazon and bought Weekend Homesteader, liked it, or suggested tags for the ebook. Thanks to you, after less than 24 hours, the ebook is #1 in the Kindle Store's Vegetable Garden section and #95 in the general gardening section for the whole site! I also appreciate those of you who popped on over to get our other ebooks and boosted EATING the Working Chicken to #1 in Kindle's Poultry Cooking section and Microbusiness Independence to #12 in Kindle's E-commerce division. Wow! I feel like I'm on the New York Times bestseller list. I have a couple more requests, then I'll shut up about this ebook project. It would be great if we kept on a roll and stayed up there in the ratings long enough to get random strangers buying the ebooks, so I'd be thrilled if you like, tag, or buy the book (if you haven't already.) Perhaps more important, though, I could really use some reviews on all three ebooks. Two reviewers posted nearly identical negative reviews on Microbusiness Independence this morning, and I felt like a failure until Mark pointed out that the reviewers might have a competing ebook and be trying to run down the competition. Sure enough, when I clicked on their profile, all of their reviews are 1 star. Still, I don't think most people are going to go to the trouble of checking on those negative reviews, and I'd love to drown them out with a tide of good opinions. 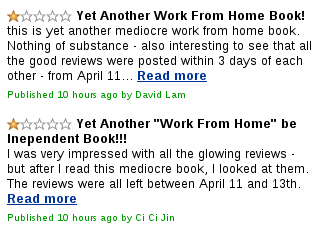 Don't lie, of course, but if you enjoyed the ebooks, please leave a review. Finally, I was really serious about emailing you a free copy of Weekend Homesteader's May edition if you don't want to jump through Amazon's hoops. Even though I'm trying to leverage the site, I don't approve of their monopoly. So, feel free to email me if you want to read the ebook without buying into the Kindle format. Thanks again! You've all made my day! It would almost be funny... if it weren't such a childish and potentially harmful thing to do. I wonder if those kinds of drive by negative reviews violate any terms of service? I am tempted to press the "report abuse" link. I just commented on your book. Sorry about the reviews. I really liked the book. I've been "kindling" for awhile and hope you stay in. We just need lots of people to call their comments unhelpful and they will be downgraded. Thanks again for the blog and books!!! Erich --- I'm going to have to check out that book! I was just thinking yesterday that I'm stabbing in the dark and I could use some expert advice. I didn't realize there was recourse about the reviews --- I'll have to try it! Jonathan --- Good point --- just having people say the comments were unhelpful would knock them out of the running quite effectively. Thanks for your kind words and the review.